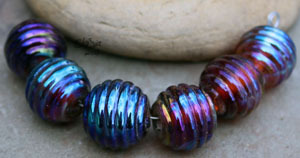 On these pages you will find glass lampwork beads made by myself in my small home studio. Each set of beads or headpins are made to order, kiln annealed for strength, cleaned with a diamond bit cleaner and inspected. My lead time is 10 business days, it may take that long and might not, it depends on current order log. - Beads are all wound on 1/16th inch (1.5mm) mandrels unless otherwise noted, if you need a different hole size, email me to see if it can be done. 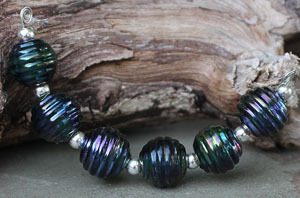 This page is for metallic beads. These cannot be etched or you lose the metallic finish, which is a result of silver laden glass that is worked in the flame to bring out oil slick metallic effects. Subscribe for sales, new items, giveaways, and more!